“Partitioning phylogenetic and functional diversity into alpha and beta components along an environmental gradient in a Mediterranean rangeland” by Bernard-Verdier M., Flores O., Navas M.-L. and Garnier E.
This paper, now in early view, is part of a special feature on Functional Diversity edited by Norman Mason and Francesco De Bello, which will be published in a single issue of JVS very soon. In this paper, we show that phylogenetic and functional diversity both capture very different facets of community structure in a Mediteranean rangeland. Phylogenetic diversity was not a proxy for functional diversity either at the alpha (within communities) or the beta (among communities) scale. However, phylogenetic patterns did reveal some complementary information not captured by the set of functional traits under study. 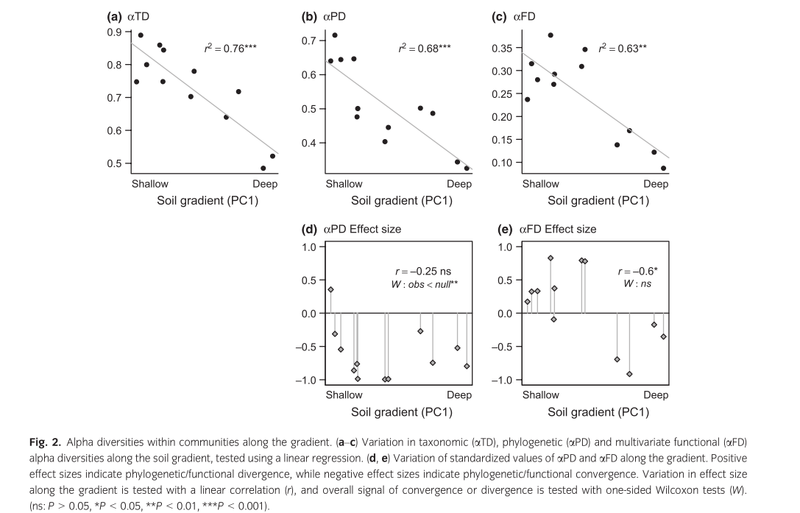 An important methodological message of this paper was to highlight the need to take into account (and remove) the effect of species abundance evenness within communities in order to properly compare patterns of functional and phylogenetic diversity.